New light has been shed on the creation of Logan Garden by a previously unknown album of photographs and watercolours recently acquired by RBGE Library. Believed to have been from the estate of Sir Archibald Buchan-Hepburn of Smeaton (1852 – 1929), the album records expeditions by his nephew Douglas McDouall of Logan (1872 – 1942) to Angola in 1904 and the East African Rift Valley in 1909; it also includes 15 watercolour views of the Mediterranean, probably Spain. As illustrated by RBGE’s McDouall Collection of photographs, from around 1900 Douglas and his elder brother Kenneth (1870 – 1945) gradually transformed the traditional country house walled garden at Logan into an exceptional place where tender introductions from around the world were grown in the open. 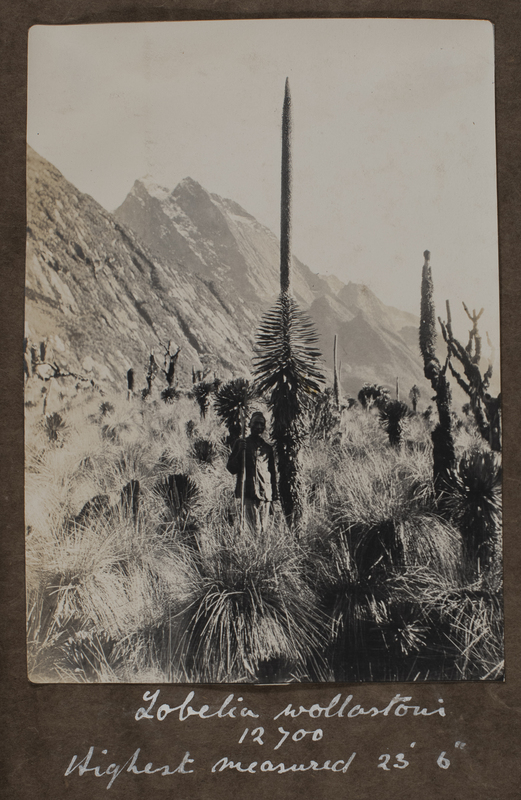 While it was thought that as well as supporting the expeditions of plant hunters, the brothers travelled widely to collect plant material for themselves, the album offers the first physical evidence of such journeys. The record of the Rift Valley expedition which predominates, is particularly illuminating. Dated from January to June 1909, the 77 gelatine silver prints, 31 watercolours, and 5 pencil drawings were made during a journey, starting in the Ruwenzori Mountains, and taking in, among others, the Virunga Mountain Chain, and Lakes Edward, Mutanda, Mwuleru and Ruisamba, thus progressing through the borders of modern-day Uganda, the Democratic Republic of Congo and into Rwanda. Apart from views of the countryside, the expedition camp and photographs of local people, one showing them in company with Douglas McDouall, the prints are largely concerned with plants. Shots of species endemic to the Ruwenzori area are accompanied by notes of the location, the altitude, and the size of the specimens. The accompanying watercolours show a lively appreciation of the terrain, the vegetation and the local inhabitants, animal and human. 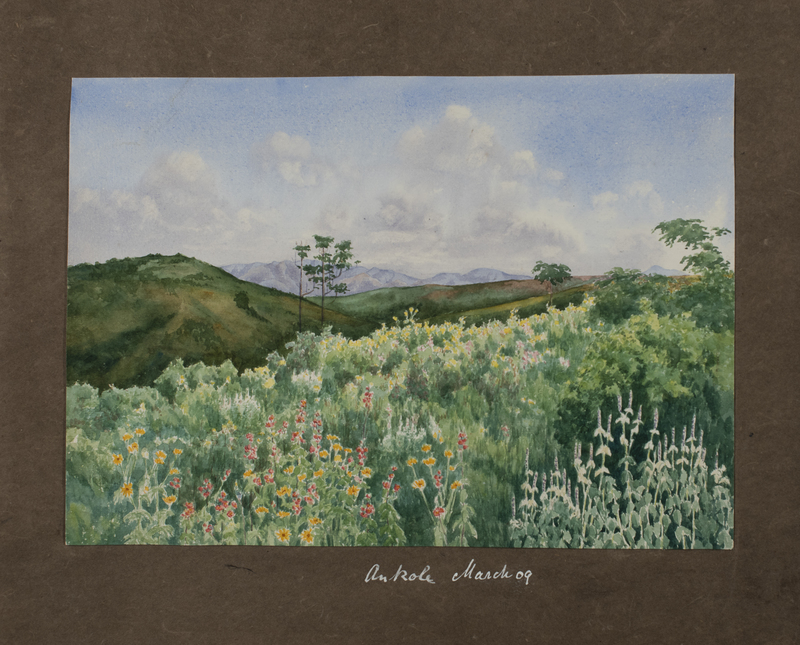 It is likely that a selection of these were the ‘watercolour drawings by Mr Douglas McDouall in illustration of the flora of Mount Ruwenzori and neighbourhood’ exhibited by Sir Archibald at a meeting of the Botanical Society of Edinburgh later in the year (11 November). In the absence of expedition notebooks, we cannot be certain that plant material was brought back to Scotland from either of the African expeditions. What can be said, from the evidence of record photographs in the McDouall Collection and the publication in the 1930s of at least two illustrated articles by Kenneth McDouall, is that the cultivation of species from the Ruwenzori area remained a continuing interest at Logan. Additionally, the album illustrates how, at an early stage, the McDouall brothers began to develop their special understanding of the cultural needs of new introductions which underpinned the success of their work. Research is continuing into the background of the acquisition and the locations of the illustrations while the album itself is receiving a little conservation tlc – after which it will be available for public display.